Updated Tuesday April 10, 2018 by Poco Mens Baseball. In any instance when the language of the PMBL Rules does not cover an issue, the Baseball Canada Rules shall apply. 1.1) Membership in the League is open to those individuals and teams willing to abide by the rules of the league. Failure to adhere to the rules of the league can result in termination of membership in the league without refund of fees paid. 1.2) Members who serve on the Executive of the League shall assume their respective duties and positions effective immediately after the Fall AGM and Election. 1.3) Team fees shall be determined by the Executive annually at the Spring Managers Meeting. 2.1) An Executive Team consisting of the elected positions of Commissioner, Vice Commissioner, Webmaster, Scheduler, Treasurer, Umpire Coordinator, Secretary and Discipline Committee will govern the League. Positions will be 2 years in length. Executive can stay on past two years if no other candidates come forward. 2.2) All members of the League are strongly encouraged to participate as a member of the executive. Nominations are encouraged prior to the league A.G.M. 3.1) Commissioner – Presides over the general activities of the league. 3.3) Webmaster– Maintains the website, coordinates player registration and maintains spare list. 3.4) Scheduler – develops and maintains league schedule, rainouts and cancellations. 3.5 Treasurer– Shall be in charge of all monies or other property paid or donated to the league and shall disburse the same on direction from the executive. Prepare annual budgets and financial statements. Ensure financial records are available for review by interested league members. 3.6) Umpire Coordinator – Assigns umpires and co-ordinates the umpire schedule. Umpire Coordinator will also submit the total money owing per umpire for playoff games, to the Treasurer at the conclusion of the playoffs, with mailing address for each ump and a cheque will be mailed out. 3.7) Secretary– Responsible for compiling meeting minutes and oversees the advertising and running the new player draft as well as distribution/maintenance of park keys. 3.8) Discipline Committee – Responsible for ruling of all discipline events that take place in the league. The committee is to consist of an odd number of members ( plus one umpire representative ) to allow the committee to vote on all items, producing an outcome for all events and should not include more than one player from any team. 4.1) There will be a minimum of 2 meetings per year Fall AGM and Spring Managers Meeting. Each team will be represented by two players. On voting matters, each team will have two votes, unless only one player is there to represent their team. 5.1) All teams are responsible to outfit their teams with a uniform of consistent baseball style and quality which will consist of a numbered jersey and baseball pants. No shorts are allowed. 5.2) Substitute or spare players may play without the benefit of a uniform at the consent of the opposing team manager. 5.3) All batters and runners must wear a batting helmet with at least one ear flap while catchers must wear a skullcap or an approved helmet / mask. 5.4) Wood and wood composite bats are allowed, no metal bats of any kind including medal handle/wood barrel bats. 5.5) All players on a roster, positioned players must wear a jersey during the game with the exception of the catcher (who must wear his jersey to bat). In the case of uniforms without sleeves some kind of undershirt with sleeves must be worn underneath. 5.6) Metal cleats are allowed. 6.1) All games will be seven innings unless rain, lack of light, diamond commitments or umpire decision prevents the full seven innings from being played. Otherwise four full innings (or 3.5 innings in the instance where the home team leads at that point) will decide a game. Every game will begin on time, however the umpire may allow a fifteen-minute grace period to assist a team in fielding a full nine-man roster. 6.2) A suspended game will be played from the point at which the game was halted. 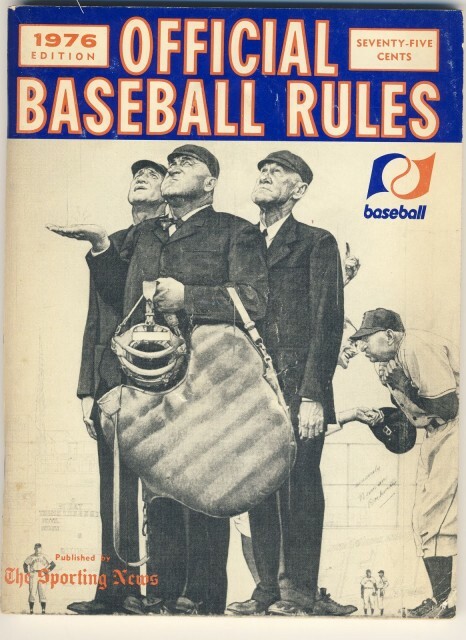 Only the umpire may call a suspended game and at that time the umpire and both team managers will agree to the specifics of the halted game; recorded score, inning details and pitch count. The details will be recorded and forwarded to the league executive. Rosters for the continued game may not necessarily reflect the rosters for the suspended game. The intent when continuing play on the suspended game is to play a full seven innings. 6.3) There is a 5 run limit per inning with the exception of the last inning being an open inning. An over the fence home run does count, and all runs count even in excess of the five run limit. In the playoffs the run limit is not in effect. 6.4) Only the umpire or team managers can decide on rainouts or cancel a game. All players must be present at the diamond regardless of the weather unless it’s determined ahead of time that the game will not take place. Team managers must communicate and make the decision to call the game off due to weather a minimum of 2 hours before game time . They must also notify the umpire coordinator and scheduler of the cancellation. 6.5) Any rainout or cancellation will be made up at a time determined by the Scheduler. 6.6) In the event of a tie game at the end of seven innings, an eighth inning will be played to determine a winner. The eighth inning will be played using the international tie breaking format. The top of the eighth will begin with the visiting team putting their last two recorded outs on second base and first base respectfully. Three outs are required. The home team finishes the bottom of the eighth in the same manner. If the game is still tied after eight, the game will be declared a tie. 7.1) It shall be the responsibility of the HOME team to setup the field for play and the VISITING team shall maintain the field after the game. 7.2) The home team will have the choice to choose which dugout they will use. 8.1) A player is eligible to participate in the league provided the player turns thirty during the calendar year of that season. 8.2) Each player will have to fill out an online registration form before being placed on a roster. 8.3) Any current player wishing to change teams may do so by either re-entering the draft, however the draft process does not guarantee that a player will be selected. Or a player may choose to play for another team provided that the other team manager would like to select him. In this event the player choosing to leave an existing team and join another team must stay with that team for the duration of the season. The deadline to change teams is July 1st. 8.4) Team rosters are limited to 18 players, any additional players will incur a cost (around $8-$10) to be on the full time roster. Once the season starts managers may add and delete players (if necessary) from their roster at any time. 9.1) A team must have 8 players for an official game including at least 6 of it’s own rostered players. Teams may use players from the spare list, or fill the positions with any one available to play provided they meet the league eligibility requirements. If a team cannot field a minimum of 8 players, the forfeit team would be officially disqualified and concede the win to the opposing team. Forfeits will result in a $100 fine applied against the teams performance bond. 9.2) Prior to the game commencing, teams must submit a batting order of all players playing complete with the date and opponent, player’s names and jersey numbers. Every player must bat, although teams have the option of batting only 12 if they have more than 12. If this is the case they may use substitutions within the 12. 9.3) There is no limit to the number of defensive substitutions allowed, with the exception of pitcher, and no defensive change will cause a change in the batting order. Once a pitcher has been replaced that player may not return to the game as a pitcher. All players in the lineup will bat unless an injury during the course of the game prevents them from doing so. If this situation arises then the injured player will also be removed from the game. 9.5) Use of rostered players from other teams may only be done in emergency situations. They can only play if the team is short to a 9 man roster, they must bat at the end of the batting order, and they may only play in the outfield. 9.6) Teams with 8 players must take an out in the 9th spot in the order. 9.8) Late arriving players must be listed in the batting order, if the players at bat comes before he arrives the manager must either scratch him from the game, or take an automatic out. 9.9) Teams with more than 12 players may choose to bat 12 and use subs, otherwise all must bat. In the playoffs this number is reduced to 10. 10.1) A Draft will be conducted prior to the beginning of league play each year. The purpose of the draft is for Team Managers to evaluate potential new players entering the league and existing players choosing to re-enter the league with a different team. Entering the draft does not unconditionally qualify a prospect (new or previous member) for a position on any given team. The choice to draft any player is at the discretion of each Team Manager. 10.2) Determining the order each team chooses in the draft would be based directly on the order in which each respective team finished in the previous year’s play (regular season). Therefore the team finishing last in the standings the previous year would have the option to choose first in the draft or pass on their option giving that choice to the next team in order. This process would be conducted through ongoing rounds should the demand for players be intact for each team and the supply of players warrant the option. Teams are not able to trade their picks. 10.3) Teams new to the league will be placed into the last seasons standings with a .499 record. Meaning, they will draft immediately following all non .500 teams. 10.4) Any player not chosen in the draft may be added to the League’s Spare List. The spare list players are eligible to play on any team requiring a substitute player. 10.5) Players entering the draft must be informed that they are required to play for the team that drafts them for that upcoming season. They cannot change teams during their first year of play. Following the completion of their first season, the drafted player can choose to play for another team or re-enter the draft. 11.1) Each registered player must have played a minimum of 25% of the scheduled games in order to be qualified to play in the playoffs. Players who are injured and are unable to participate in the required amount of games may appear in the playoffs upon application by their teams to the executive. The executive will have the final decision in these matters. 11.2) Players that have been injured and are applying for playoff eligibility, must meet the following criteria. The player must have been a rostered player the previous season and must have played in a min. 50% of that teams games the previous season. All injury applications must be made prior to August 1. 11.3) In the playoffs no team will be allowed to use a player from a non-playing team to fill a roster shortfall. Additionally, in the playoffs, no team can take a player from the spare list to play unless the team is short to a 9-man roster. If a team cannot be fielded for the playoff game the game will be forfeited. 11.4) All playoff series will be a best of three format. 12.1) There should be no beer or alcoholic beverages allowed on the field or on the players bench before, during or after games. Players are expected to come to the park ready to play and anyone suspected of being under the influence of alcohol or other substances will not be allowed to play. Managers must ensure that all players are fit to play. 12.2) The Discipline Committee has the right to suspend or expel any player who abuses league rules or who does not exhibit a sense of sportsmanship or who plays without regard for the safety of others. 12.3) Fighting among players or contact with an umpire will be grounds for expulsion from the games and possible further action as seen fit by the executive or discipline committee. 12.4) Players shall not intentionally collide with or cause any injury to another player. A base runner must either slide or give up their right to the base by stopping or leaving the base path if a defensive player has possession of the ball or is about to take possession of the ball. A defensive player who is not in possession of the ball or not about to receive the ball for the purposes of recording an out cannot block the baseline, base or be in the way of a base runner sliding. The umpire will award an out or safe base if an opposing player intentionally collides with another player or in some way contravenes this rule and may expel the offending player. 12.5) An umpire has sole discretion to expel any player or manger from the game for violating any of these rules including the use of foul language or if in the opinion of the umpire a players actions are abusive to the game, league, players, umpires or spectators. 12.6) A minimum one game suspension will be administered to all player ejections to be applied to the next scheduled game. ** There is NO appeal process for the one game suspension as a result of an ejection. 12.7) All ejections require an umpire report submitted within 24 hours to the Umpire Coordinator with a copy to the Discipline Committee for review. Additional suspensions may occur based on the details surrounding the ejection in question and/or the individual players history with suspensions in the PMBL. 12.8) Each team is required to provide the Treasurer with a sum of $200 at the start of the season as a performance bond. These funds are separate from league fees and will be used to cover fines incurred by those teams through the regular season and playoffs. Please refer to the performance bond for more details. New teams must submit their bond prior to the schedule being confirmed. Teams must top their PB to the $200 level if they had charges against it last season. 13.1) Teams may use a maximum of two pinch runners per game, used at their discretion. 13.2) The runner inserted MUST be the player who made last out for that team. If it is discovered the wrong runner was used the runner will be declared out. 13.3) In the first inning if the pinch runner rule is used before an out has been recorded, the player in the final batting order spot will be the pinch runner. 13.4) Courtesy runners for the catcher when there are two out and batters hit by pitch are not counted toward the 2 runners. The runner must still be the last out, but does not count toward the teams two allowed pinch runners. This rule is not in effect in the event the offensive team is not guaranteed to take the field again. 13.5) You cannot interrupt an at bat to utilize a courtesy runner. Once a pitch has been made to a batter you have to wait until that batters at bat is over to use a pinch runner. 14.1) It is the responsibility of the winning team to report the score on the website. Both teams are required to input game statistics. External links are provided for reference purposes. Poco Mens Baseball is not responsible for the content of external Internet sites. Copyright Poco Mens Baseball All rights Reserved.